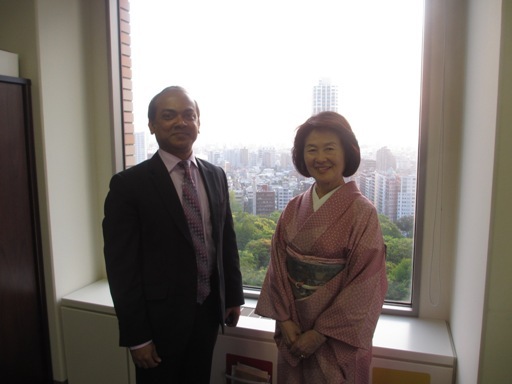 President Sachiko Yamano on April 27 received Mr. Mohammad Hasan Arif, Commercial Counsellor of Embassy of the People’s Republic of Bangladesh. 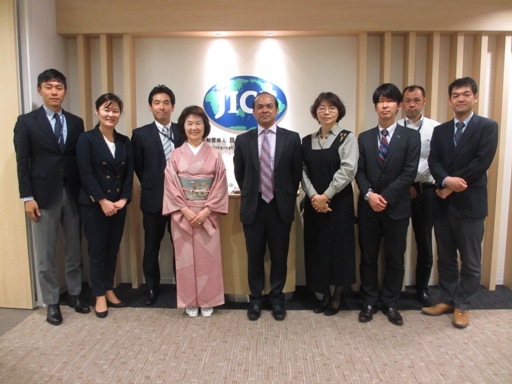 Mr. Arif expressed his deep gratitude to JICE for the support during his study at Yamaguchi University under Japanese Grant Aid for Human Resource Development Scholarship (JDS) from 2003 to 2005. He expressed that the outcomes of his study are not only Master’s degree in economics but also precious lessons learnt from Japan that have made him a better person. Mr. Arif emphasized the importance of follow-up activities on JDS returned fellows, and indicated that the Government of Bangladesh is paying more attention on the follow-up activities and promoting collaboration with related Japanese organizations. Mr. Arif, as the General Secretary, also introduced the activities of JDS Alumni Association in Bangladesh. He shared that one of the JDS graduates has become a Joint Secretary of Ministry of Finance in Bangladesh. Both parties agreed with strengthening the partnerships for further collaboration. Mr. Arif (center) has returned to Japan as Commercial Counsellor of Embassy of Bangladesh after study in Japan under JDS. JICE and the Embassy of Bangladesh will strengthen the partnership for further collaboration.